The weather for this weekend's race was PERFECT! 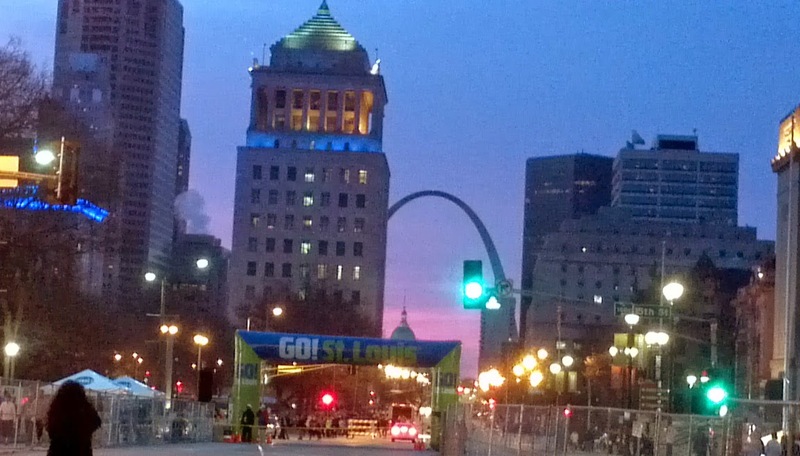 I was able to get a great parking spot downtown and I made sure that I had plenty of time to kill before the race started at 7 a.m. As I was heading towards my corral, I was able to see the sun rising behind the Arch. Beautiful! The Go! 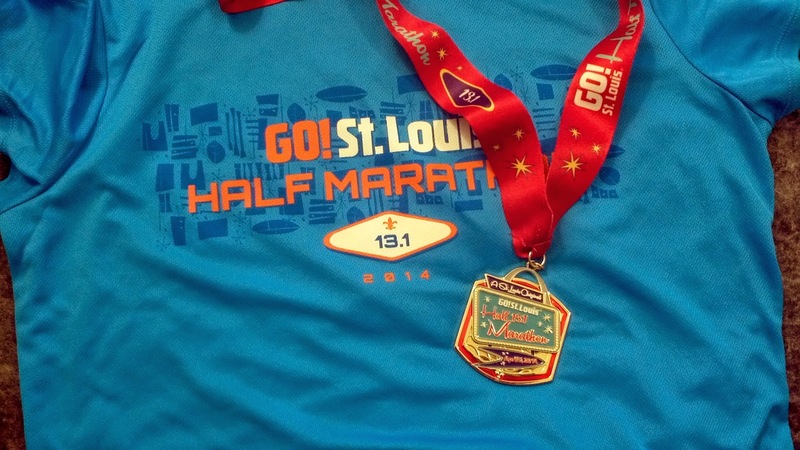 St. Louis Half and Full Marathon courses give a great view of the city for out-of-towners. 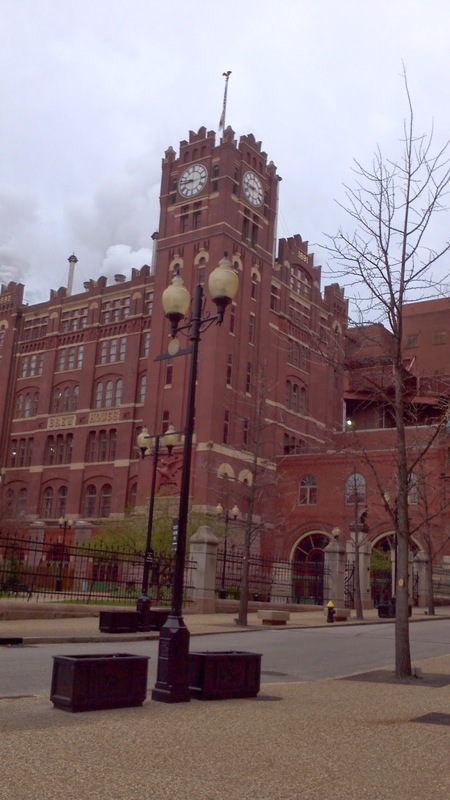 You briefly get to run through the Budweiser brewery, but if you are coming from out of town I recommend taking a free tour. 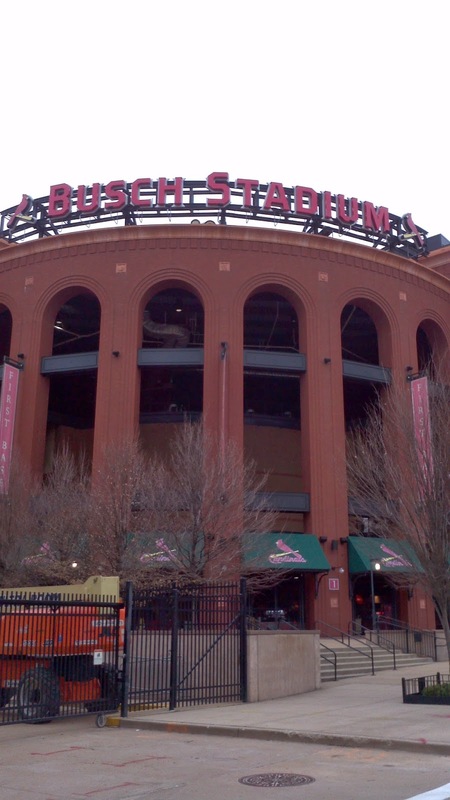 You also get to run by Busch Stadium, home of the St. Louis Cardinals. 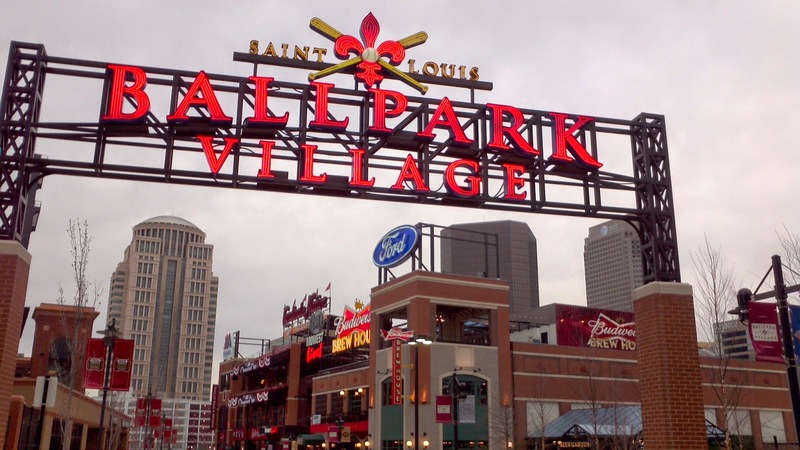 They also offer tours for a small fee, or you could always try to catch a game. 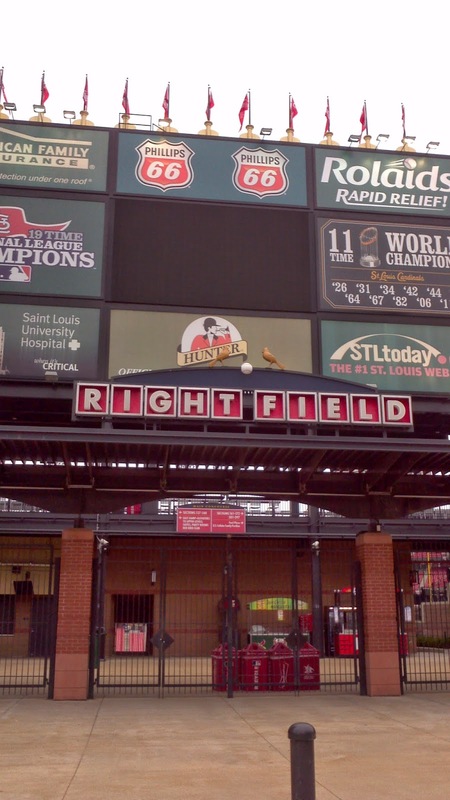 I haven't even been to the new Ballpark Village yet, but I did make sure to stop and take a picture. I must have looked exhausted because two bystanders asked if I was ok. When I told them that I was just stopping to take a picture, they asked if I wanted to be in it. I HATE pictures of myself during a race (in fact I cover my bib in most cases when I see a photographer on the course), so my answer was, "no thanks!" 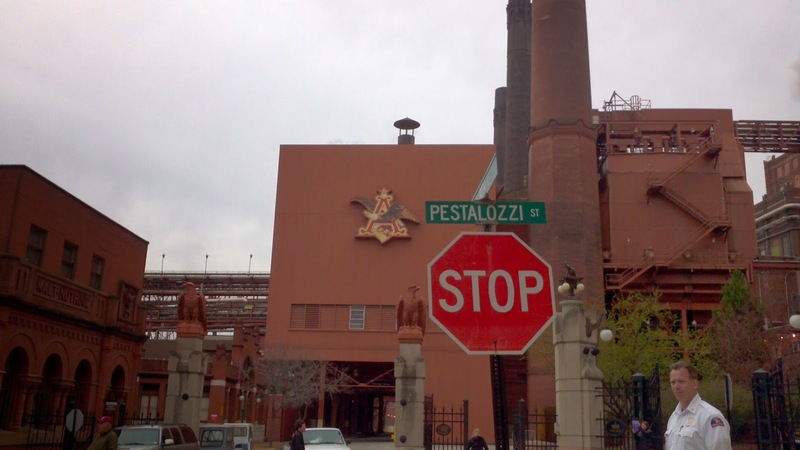 St. Louis is surprisingly hilly. In fact, there is a portion of the race (feels like an eternity but I think it is around a mile long) called Holy Hill. 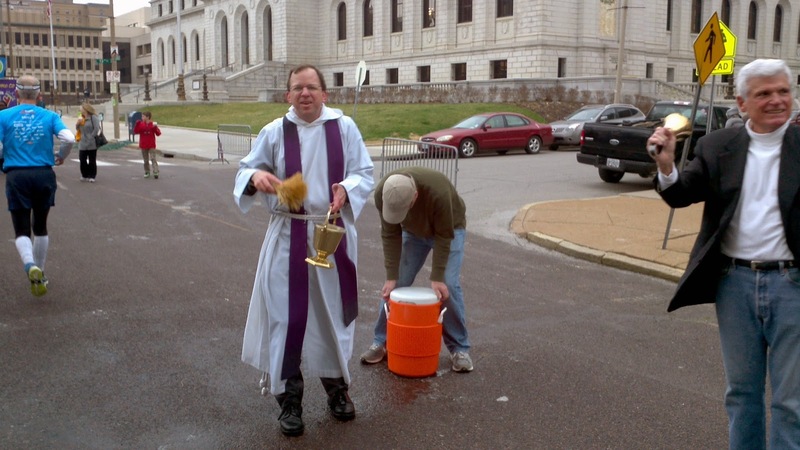 At the beginning of the hill is a priest that blesses the runners with Holy water as they pass by. 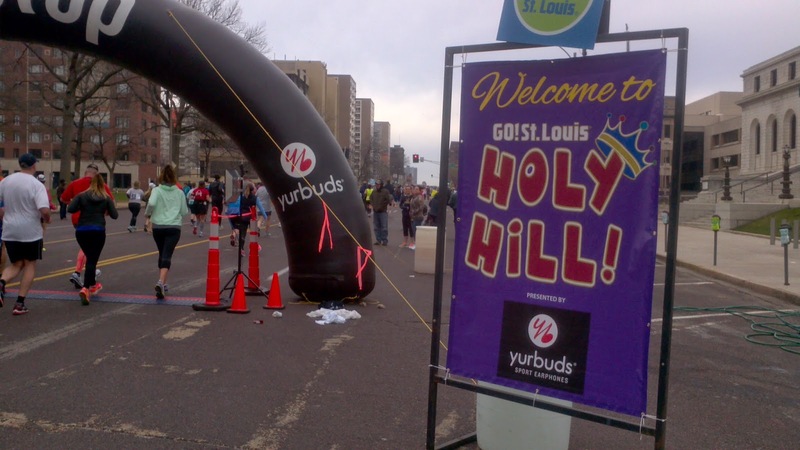 You are not only timed for the overall race, but you also get a time for the Holy Hill portion of the race. Another great thing about this race, the Crown Candy Kitchen chocolate stop. 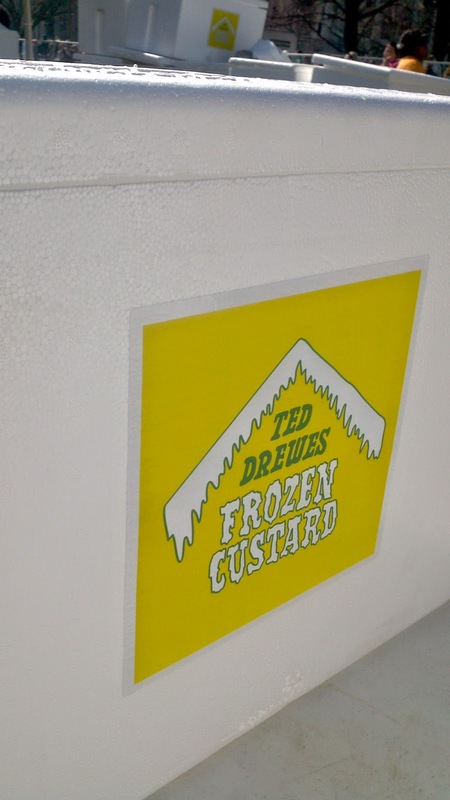 The finish line food was AMAZING and included local favorites like Ted Drewes Frozen Custard, Pasta House toasted ravioli, pretzels, graham crackers with peanut butter and jelly in addition to your typical fruit in a cup, bananas, and chocolate milk. Despite my right hamstring being tight again this weekend, the race was an amazing experience that I would highly recommend to out-of-towners as well as locals. The shirts were great as were the medals. GO! 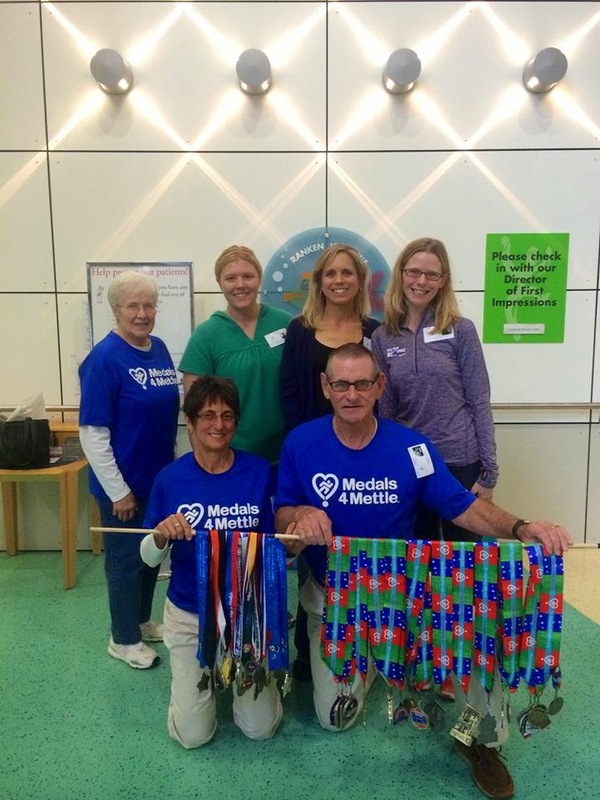 St. Louis Marathon Weekend in the news.